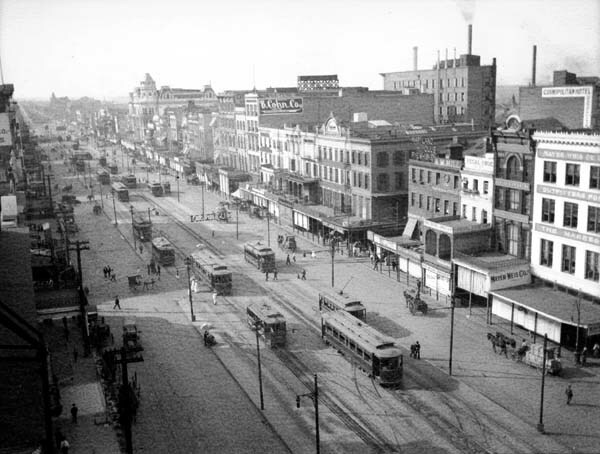 Lovely photo of Canal Street from around 1900. The building with the big cupola in the background is the Mercier Building, the first home of Maison Blanche. The streetcars in this photo are a combination of single-truck (one set of wheels), and double-truck (two sets, like the streetcars in use on Canal and St. Charles today). The single-truck streetcars with a narrow monitor deck on top are Brills; the ones with a wider monitor deck are Ford, Bacon and Davis cars. The double-trucks at this time are Brills. New Orleans wouldn’t see the now-legendary arch roof style cars until 1915. Usually this would be cross-posted to CanalStreetcar (dot com), but the site’s down temporarily, as we migrate its content to WordPress.